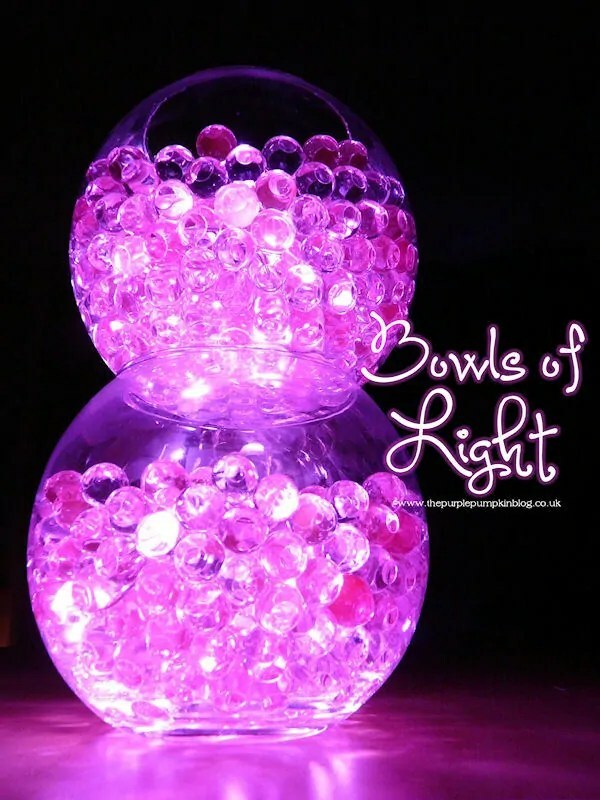 For day 20 of Cook, Craft, Create: December: 2012 I have created, what I think is the coolest decoration ever…bowls of light! I had bought some water gel beads from a craft fair, with the intention of doing something with them for Christmas. They are little beads, that you soak in water and they swell up…they are often used in floral displays. After leaving the pearls in water for a few hours, they swelled up to a nice size and I drained off all the excess water. I then divided all the pearls up into two fish bowls that I bought and then dug out the bright pink submersible waterproof LED lights I’d bought. I put the lights into the bowls of aqua gel beads…and there we have it…bowls of light! And they look so awesome! I LOVE them! I’m not sure how long the beads last – but they’ve been in the bowls now for close to a week and still going strong! Love these lights for a ballet dance party for little girls or even a dance theme party for teens. They could work well for both! Did you use clear or purple beads? Ive heard of this being done with small glowsticks as well– thoughts? I used pinky/purple coloured beads – but also used pink lights. There are loads of different colours available. Not sure how well it would work with glowsticks, as they lose their glow quite quickly. Thank you :) Let me know how you get on! It seems in your pictures like your aqua beads have grown quite large. We can’t get are beads to grow that size and can’t find anywhere that sells “large” beads. Our beads have grown to approximately the size of a 5p coin, maybe a bit smaller. Yours look like they’re about the size of 50p coins. Or have we got it all wrong and the fish bowls in your pictures are actually more glass/tumbler size? Please help. We don’t want tiny balls! Thanks so much for your help. There are different size beads that you can buy – I can’t remember now which size I bought, but they were not as large as a 50p, but not as small as a 5p. You also need to make sure that they soak for a long time and that you have enough water in there. The ones I had needed several litres of water and be left for 24 hrs to swell to maximum, but I didn’t leave it that long. The bowls are about 6-7″ in diameter. Hope this helps! That’s so helpful, thank you. Would you mind telling us where you got your beads from? So sorry for the 21 questions! Don’t mean to be a pain!